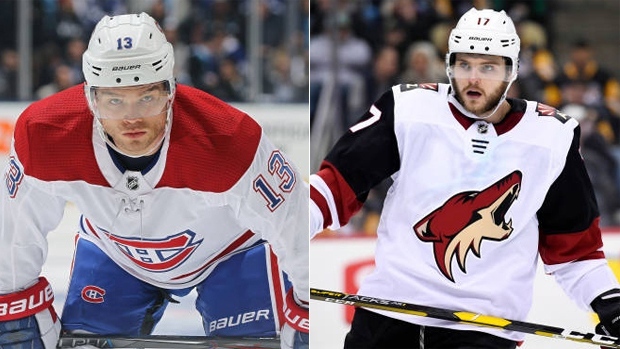 It's been six months since the Montreal Canadiens traded Alex Galchenyuk to the Arizona Coyotes for Max Domi in a swap of forwards who were failing to achieve their past success. Galchenyuk, the third-overall pick in the 2012 NHL Draft, was two seasons removed from a career-high 30 goals and the Canadiens had moved past the idea of playing him at centre, his drafted position. He scored 19 goals and posted 51 points – the second-highest mark of his career – last season, but had a minus-31 rating that ranked tied for fourth worst in the NHL. Domi, a first-round pick in 2013, scored 18 goals and posted 52 points in a breakout rookie season in 2015-16, but was limited by injuries in his second season with the Coyotes and scored just nine goals with 36 assists last season. Galchenyuk and Domi will face their former teams for the first time on Thursday night, with the two players going through vastly different seasons. Arizona general manager John Chayka said he believed the Coyotes became "a better team today" when the swap was made. He added the team planned to use Galchenyuk at centre, and had used the trade to improve their depth at the position. Galchenyuk started the year at centre for the Coyotes, but was moved to the wing this week after returning from a three-game absence due to a lower-body injury. He has three goals and eight points in 23 games this season and Coyotes head coach Rick Tocchet said the move was made because Galchenyuk was "thinking too much" while playing centre. "He feels bad he's not scoring but he's like our team – we're not scoring," Tocchet said. "Ten games ago, we were two games over .500, the next thing you know we're not scoring goals. We've lost a few games here and we've got to get it back. He feels bad like a lot of guys." The Coyotes, who have been held to one goal or less in three of their past four games, have just 14 goals over their past seven games. Galchenyuk, meanwhile, has gone 14 games without a goal and has just two points in his past 10 games. When Domi was acquired, Canadiens general manager Marc Bergevin said he believed the 23-year-old was capable of more than what he showed in Arizona, while admitting he was coming off a tough campaign. "He's got energy, he competes every shift," Bergevin said. "There were times last year where he had a tough time, I admit it. We watched him and there were nights we were wondering. But I think the package, what's underneath that rock, I think there's a lot more there. "The fact there's a change of address, he comes to a place where he wants to be, I believe he'll thrive in this market." A winger with the Coyotes, Canadiens head coach Claude Julien elected to try Domi at centre in training camp with Jonathan Drouin, a centre last season, on the wing. Though his preseason was limited to just one game due to suspension, Domi debuted at centre for the Canadiens in Game 1 of the regular season and the switch has been paying off. Through 35 games this season, Domi has 14 goals and 33 points with a plus-4 rating while centering the team's second line between Drouin and, most recently, Andrew Shaw. On Tuesday, he pointed to puck luck as the biggest reason for his success. While the stats since the trade point to a clear win for the Canadiens, agent Pat Brisson, who represents both Domi and Galchenyuk, said the sample size remains small. “I usually look back later, not after 30-some games,” Brisson told The Athletic. “I wait and see. So far Max is happy, but the whole team in Montreal is going way better than anyone expected. They have a lot more wins and a lot of players on that team seem to have found themselves and it has a domino effect. Domi, who argued against notions he wanted out of Arizona following the summer trade, said he's looking forward to his return to Glendale on Thursday night. "It's going to be weird, for sure," Domi told NHL.com. "I've never been traded in my life, so it'll be different. But it'll be cool to see some of the old training staff and coaches and obviously my teammates. I'm definitely excited for it." Viewers in the Canadiens region can watch the game LIVE on TSN2 at 9pm et/10pm at.